Apart from the initial strengthening of your fingers learning how to play barre chords is one of the easiest and most useful things you can do on a guitar. What is a barre chord? A barre chord is simply a guitar chord where one of your fingers, usually your index (1st) finger presses down on multiple strings at once. In the most common barre chords the index finger presses down across all of the strings, or 5 of the strings, forming a “bar” across the strings. The remaining fingers perform the chord pattern. Why are Barre Chords Easy and Useful? As you’ll see below creating a barre chord uses the same patterns across the fretboard. So it’s easy to remember the chord shapes. It’s also very useful because if you ever need to play a particular chord – let’s say G# Major – then you just need the same pattern as other major barre chords and find the starting position (the root note). This will become more clear as you read below. 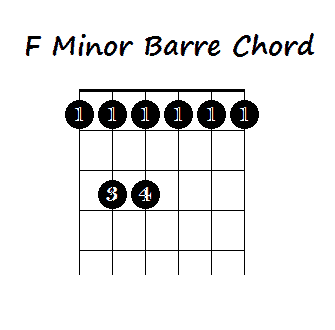 The first type of barre chord is also the easiest so a great way to start. These barre chords use the basic E major shape from the open E major chord. If you aren’t sure about the Major E open chord or other basic open chords and how to read chord charts see the link below. 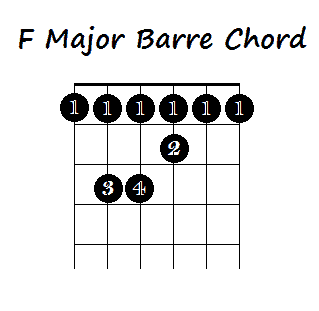 For the first major barre chord see the chart and explanation below. First “bar” the 1st fret on the guitar by pressing your index finger over all of the strings. Now strum all of the strings and voila you’ve played your first barre chord! You might notice some buzzing to start with as your hands may need to strengthen to be able to press down all the strings with your index finger. Also you may notice strain in the back of your hand and/or your wrist and/or the palm of your hand if you are holding the barre chords for a while. You will strengthen up and this shouldn’t be a problem for too long – unless the action on your guitar is too high. You’ll notice that the pattern formed from your second, third and fourth fingers is the same as the open E chord. Essentially this is the open E major chord but one fret along. Now, to play an F# major barre chord simply slide all of your fingers along 1 fret – now you are “barring” the second fret, your 2nd finger is on the 3rd string 3rd fret, your 3rd finger is on the 5th string 4th fret and your 4th finger is on the 4th sting 4th fret. Now to play a G major barre chord simply slide along another fret. And so on to play G#, A, A# etc. Now you could play all of your major barre chords on the 6th (Low E) string but the frets narrow the closer you get to the sound hole of the guitar so it becomes more difficult. Plus, sometimes it is more convenient to play a chord closer to the headstock of the guitar to make easier changes to other chords. With major barre chords on the 5th (A string) you simply barre all of the strings, except for the 6th (Low E) string, with your index (1st) finger. The tip of your index finger should mute the 6th string so it doesn’t sound when you are strumming the chord (or you can make sure you don’t hit that string as you strum but I find that more difficult and requires a lot more concentration). Alternatively you can actually barre the Low E string and strum it. That note will actually be in the chord – you just won’t be playing the chord with the root note as the bass note. For major barre chords on the 5th (A string) you will be using the shape of the open A chord. If you are not sure about how to play the open A chord see the link below. Now barre the first fret with your index finger and create that “A shape” with the rest of your fingers in the third fret. Strum all the strings except for the 6th (Low E) string. Now you’ve just played an A# (a.k.a. 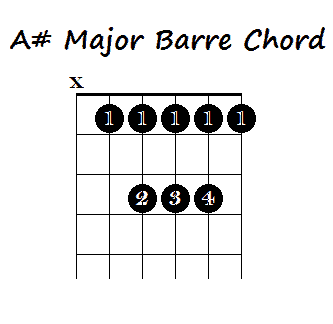 Bb) Major Barre chord. To play a B major barre chord simply slide along one fret so that you are barring the 2nd fret with your index finger and creating the A shape in the 4th fret. And so on for whatever major chord you want to play. Hint: I find it easier to actually make a “bar” using my 3rd (ring finger) so that it makes the A shape (instead of using the 2nd, 3rd and 4th fingers to create shape). I find this faster and easier – This will make it more difficult to get sound out of the high E (1st string) but try out both types and see which is more comfortable/preferable for you. 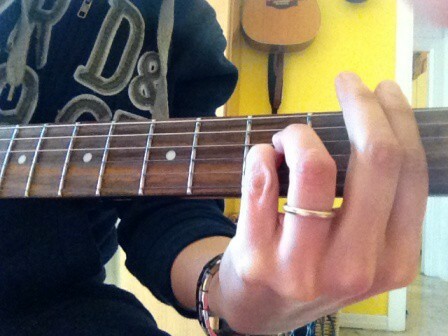 These are played in the same way as the major barre chords – in terms of the index finger barring all of the strings. In fact the 3rd and 4th fingers are doing exactly the same thing too! The only difference between the major and the minor barre chord here is that with the minor barre chord you don’t do anything with your 2nd finger. So if you want to go between a Major barre chord and minor barre chord you just need to lift off your 2nd finger for the minor chord and put it back down (on the 3rd string) for the major chord. Note that this pattern is the same as the pattern for the open E minor chord. Now to play a minor chord using the 5th string as the base note you will be simply using the Am shape in place of the A shape. Again just shift this up the fret board to play different minor chords. To learn more about the notes on the fretboard so that you can easily find the root note of each chord check out the link below. Just by shifting the same shapes up and down the fretboard you can create all of the major and minor chords by just learning a few simple shapes and changing the position on the fretboard. Practice this for a while and it will soon become second nature – and your hand strength will also improve so that you can play barre chords for longer – and with a clearer sound. Some songs are played, or can be played, entirely using barre chords so these are not only easy but really useful. Thanks for reading and I hope this post has helped you to learn barre chords. Prefer to learn by video? For some great online video lessons check out my online guitar lesson reviews. In particular you should check out my Jamplay review. This is the best online guitar lesson system I have come across so far. I would love to learn how to play and now I have an idea of where to start. Think I will just practice the Barre Chords outlined in your post for awhile. If I can’t get a handle on that, will move on to the Jamplay online video. Do you think it is possible to learn how to play without taking personal, one on one lessons? Thanks for visiting. Awesome that you’re taking up guitar! It’s probably best to start with learning some basic open chords first before moving onto barre chords. And it’s also a good idea to learn proper techniques before you move onto chords (though you should be able to get to chords pretty quickly) – that’s where lessons can really help. But that doesn’t mean they have to be one on one lessons. You can certainly learn the guitar through online videos lessons. In fact there are quite a few advantages of online lessons over in person lessons (and visa versa). Check out my post on online vs in person lessons to see what will suit you best. Whichever style of lessons you go for I definitely encourage you to take some sort of lessons – having good technique right from the start is a big advantage in my opinion. 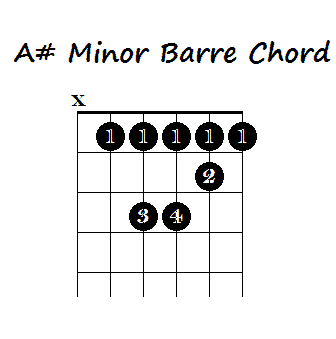 This article is jam packed with a lot of good information regarding the barre chord. I found this article especially impressive because most tutorials are either just written or just video, you often don’t see someone offering both. If I wasn’t so bad at playing instruments then I’d perhaps try to pick up a guitar and learn something like this. Thanks for stopping by and thanks for compliment – even if it was undeserved. I’m not sure where you saw the video? I don’t currently have any videos but I hope that it is clear without it.